The 2014 Paris Motor Show is still in full swing until next week, and the Kia booth has a total of 23 cars on display for all visitors to see! Not in Paris? No worries! 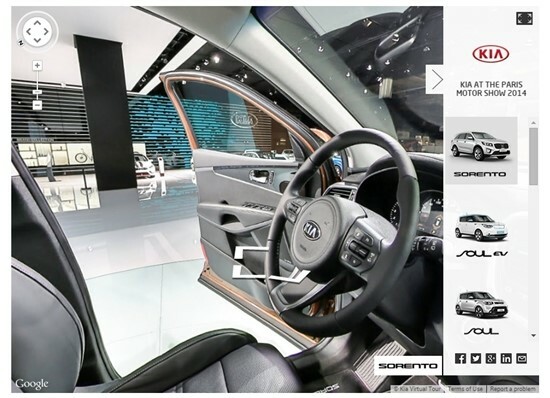 All Kia fans can now get a Kia Virtual Tour of the Kia booth in Paris thanks to Google View. Google View allows all Kia fans to visit the Kia displays at the Paris Motor Show from the comfort of their own home, even getting a peek inside the all-new third-generation 2015 Kia Sorento, the enhanced Kia Rio and Venga models, and the revolutionary Optima T-hybrid concept and the Soul EV! Powered by Google View, Kia Virtual Tour displays general information about each vehicle model, and gives fans a full 360° overview of the exterior and interiors of all the latest Kia vehicles. This way, you won’t miss a single beat! J.D.Power and Associates’ 2013 initial Quality Study (IQS) has ranked the Kia Soul and Kia Sportage as leaders in the compact Multi-Purpose Vehicle and Sub-compact CUV segments, respectively. And, for the first time, Kia ranks among the automotive industry’s top 10 nameplates for initial quality in the U.S. the 2013 Soul ranked first in the compact MPV segment for the second consecutive year, and the Sportage tied for the highest ranking in the sub-compact CUV category. According to the IQS study, Kia made substantial improvements with gains that outpaces the industry average and resulted in the brands best-ever score. The annual repost analysed responses from 83,442 respondents about 230 vehicle models and attributes across eight categories, including the driving experience, engine and transmission and a broad range of quality problem symptoms reported by vehicle owners. Playful but gutsy, sturdy yet impish – Kia’s dramatic new European concept to be unveiled at the 65th Internationale Automobil-Ausstellung (AA) on 10 September hints at a possible future B-segment contender ready to take on the urban environment with style and tenacity. Accepting any challenge that the assured modern motorist may throw at it, this concept car combines a mischievous character in a clearly robust and substantial yet stylish body shape featuring a mix of contrasting materials in compact, purposeful dimensions. 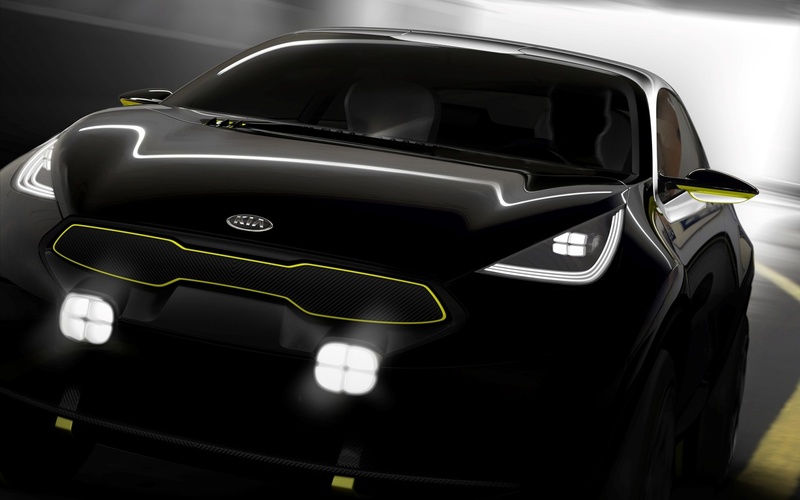 Born out of Kia’s determination to seek new compact-car options for the individualistic and demanding driver for whom size is an issue, the concept features intriguing elements not always associated with smaller cars and has been created in Europe with European tastes and expectations very much in mind. Although there are no current plans for production the vehicle’s unveiling in Frankfurt will be used to gauge potential customer response for future showroom models. This is an exact article taken from Kia Motors Vision 21 magazine issue 132 released September 2013. Kia revealed its all-new mild hybrid powertrain at the Geneva Motor Show in March. The powertrain is designed to simultaneously reduce emissions and improve engine performance in Kia’s next-generation models. 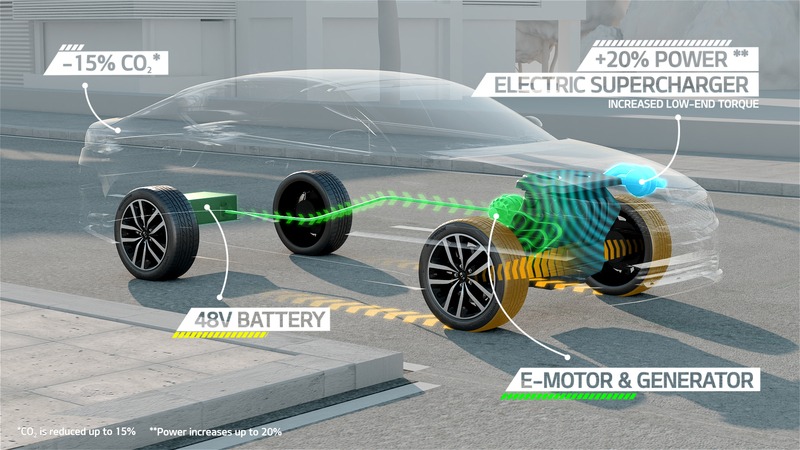 Developed by Kia’s European R&D centre, the new hybrid system employs a 48V lead-carbon battery, which powers a small electric motor to increase the engine’s power output and cut exhaust emissions. The development team behind the mild hybrid powertrain selected lead-carbon batteries over lithium-ion equivalents as they require no active cooling, are more easily recyclable at the end of the vehicle’s life and can function much more efficiently in sub-zero temperatures. Kia’s mild hybrid system will enable a car to be driven in an electric-only mode at low speeds and when cruising, while the battery is recharged under deceleration at all speeds. In heavy traffic and on urban roads, the powertrain will also feature a zero-emissions stop-start system. Using a belt-driven starter’s generator – replacing the conventional alternator – the engine is able to restart with almost no noise or vibration. The battery also supplies energy to an electric supercharger, which increases torque and power at low engine speeds. Engineers behind the development of the powertrain see the electric supercharger supporting a larger conventional turbocharger, which would seamlessly take over to provide greater power and torque as engine speeds rise. The new hybrid system could also be fitted without the electric supercharger for a simpler powertrain layout in smaller models. In applying the technologies to production cars, Kia engineers are targeting reductions in CO2 emissions of up to 15 percent, while the electric supercharger is designed to deliver power increases of 15 to 20 percent depending on its application. The new mild hybrid powertrain will be available on new diesel and gasoline production cars from Kia in the near future. Kia also used this year’s Geneva Motor Show as a stage to showcase its all-new seven-speed dual-clutch transmission (DCT), pointing the way for future transmission developments from the Korean brand. The new transmission – the first of its type from Kia – has been engineered to balance greater fuel efficiency with improved performance and to deliver a sportier driving experience. Designed as a more fuel efficient replacement for Kia’s existing six-speed automatic transmission, currently available as an option on the majority of Kia models, the new DCT combines the advantages of both manual and automatic transmissions while allowing for faster gear changes then both. Throughout the development process, engineers have been targeting a seven percent improvement in fuel efficiency and a five percent improvement in acceleration (0-100kph) over the existing six speed DCT transmission. 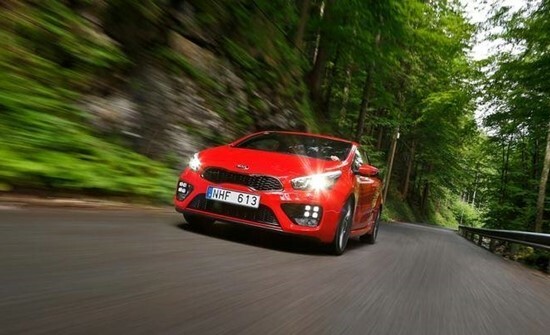 The new seven-speed dual-clutch transmission will start to appear on production Kia cars in 2015. This is an exact article taken from Kia Motors Vision 21, issue 139 magazine released April 2014. Kia Motors Corporation has announced the expansion of its ongoing global CSR program, the ‘Green Light Project’, as it celebrated the grand opening of a new Green Light School in Helene, Mozambique last march. The ceremony drew an attendance of 1500 local residents and dignitaries, including Mr Agostinho Trinta, National Director for Education. Key Kia figures behind the project also attended the grand opening, including Mr Mun-Yong Chung, President of Kia Middle East & Africa Regional Headquarters, and Mr Chang-Muk Choi, Kia Motors Corporation’s Head of CSR Management Team. 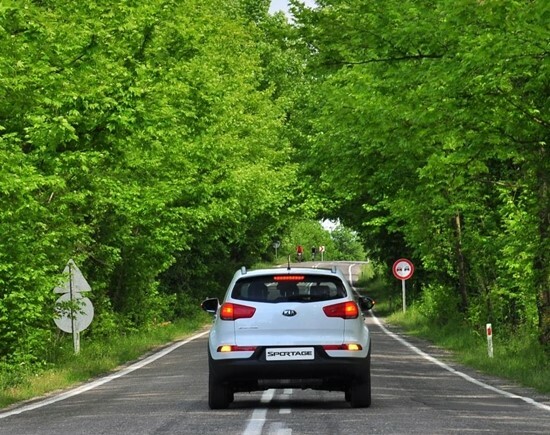 Since its establishment in 2012, Kia’s Green Light Project – a global social mobility program – has sought to improve the accessibility of health and education for disadvantaged youths in some of the poorest regions in the world. Kia’s latest Green Light School initiative is the first in Mozambique, and follows two years of investments in Tanzania and Malawi. The new project is also accompanied by vehicles to support the school’s operation, including school buses and an ambulance service. 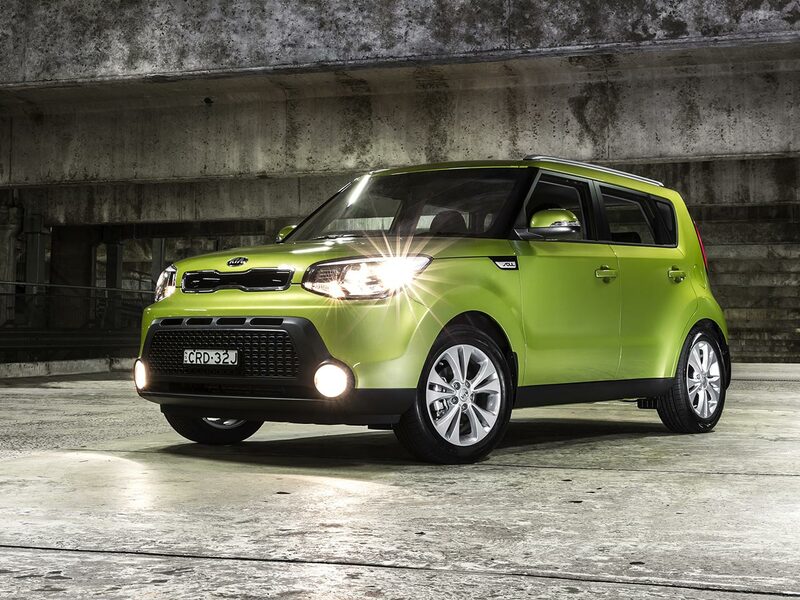 The first stage of Kia’s project in Mozambique will continue until 2018. Kia expects to make a total investment of USD 14 million in the project over the next five years. In addition to supporting the educational facility with new infrastructure, Kia plans to invest in the school itself over the next five years by providing educational materials and medical treatments, particularly antimalarial. Additional support for local officials and residents will help ensure the Green Light School’s independence in future. In August this year, a number of volunteers from Kia’s global network will visit the site of Kia’s first Green Light Project, Tanzania, to participate in community service activates with local residents. Kia also plans to expand its Green Light Project into Ethiopia in the next 12 months. this is a exact article from Issue 140 of Kia Motors vision 21 magazine. Interested in keeping the environment clean? Or how about saving some extra cash? Here are five green driving tips you can follow to do your part and save some money at the same time. The weight of the things you carry around in your car may seem trivial, but they’re not. Extra weight in the car means more energy consumption. The easiest thing you can do to increase fuel efficiency is removing items you don’t need from your car such as all those things in your trunk that you never use. It may be convenient to have them on hand, but it is costing you money to haul them around. This is especially true for small car owners; cleaning up the junk in your trunk can really make a difference. According to the official U.S. government source for fuel economy information, you can improve your MPG by up to 2 percent for every 100 pounds you unload. Tires are also important when it comes to fuel economy. Underinflated tires are not only dangerous but they also negatively affect fuel efficiency. Properly inflated tires will have less friction on the road, reducing the energy required to run the engine. According to the US Environmental Protection Agency (EPA), maintaining tire pressure at the automaker’s recommended level can improve gas mileage by up to 6 percent. So be sure to check your tires at least once a month or before going on a long trip. If you are a smooth driver, then you are on the right track to becoming a green driver. Abrupt acceleration and braking not only deplete fuel efficiency by 33 percent, but such driving habits also result in excessive amounts of pollutants. Research shows that 1 second of jamming the accelerator produces as much carbon monoxide as 30 minutes of normal driving does! Speeding also doesn’t help with fuel-efficiency. Driving at 85 mph uses 25 percent more fuel than at 70 mph. So lay off the gas and take it slow and gentle. This will definitely work to your advantage in the long run. Extreme temperatures are huge obstacles to energy saving. Using the air-conditioning drastically increases fuel consumption and emits harmful substances into the atmosphere. Besides leaving the windows open and parking in the shade, you can keep your vehicle cooler by installing window film. It is relatively inexpensive to install and extremely durable. Blocking the sunlight also has the additional benefit of reducing UV exposure, a major cause of skin cancer. As the ultimate solution, you may consider getting a more eco-friendly automobile model for your next car, one that has higher fuel efficiency and less emissions. Better yet, you could choose a hybrid or electric car that emits virtually zero emissions! 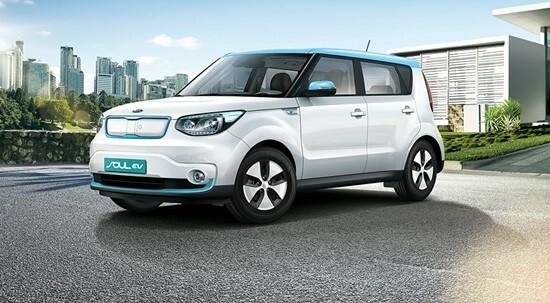 Kia is no stranger to green driving and energy savings, and has developed one of the most practical electric vehicles on the market, the Kia Soul EV. Electric car advocacy group Plug-In America found that driving an EV can save on average US$1,600 in fuel costs per year. We at Kia take energy conservation and sustainability very seriously, and we will continue to promote green driving among the world’s motoring public. There are few things more annoying than a pretty face with nothing between the ears. But when you combine beauty and brains with an accessibility that gives everyone a chance, then you’re onto a winner. And that’s the appeal of Kia’s MY14 Sportage. This handsome SUV champions value like few others in its class. And its clever TV advertising isn’t a swindle job – for build quality and dynamics, the Sportage is seriously persuasive. After switching to European production back in mid-2013, this ‘mid-cycle enhancement’ introduces some subtle styling tweaks. New grille, LED taillights and handsome new wheels 16-inch (SI), 17-inch (SI-premium and SLI) and 18-inch (Platinum) alloys mark out the latest and greatest, through the base SI still doesn’t get a reversing camera. 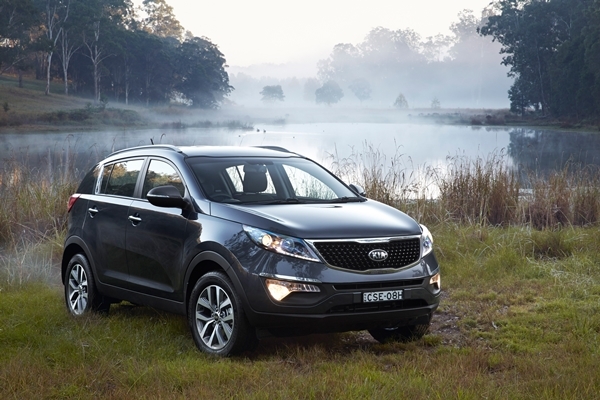 What the entry-level Sportage does get is bucket loads of space, style and kit for its razor-sharp $25,990 sticker. Bluetooth with phone and media streaming, cruise, keyless entry, rain sensing wipers, rear parking sensors and a new six-speed manual gearbox make the front-drive SI one of the best-value SUVs on the market. But all that would mean peanuts if the Sportage drove like an unhinged bullock. Instead, it’s quite likeable, powered by a direct-injection 122kW/205Nm 2.0 litre four in our six-speed auto Platinum AWD’s case, or a 135kW/392Nm 2.0 litre turbo-diesel four in AWD models for another three grand. Switching to Slovakian production meant the deletion of the torqued 2.4L petrol, so it’s ironic that the MY14’s suspension has been upgraded to account for an increase in towing priorities. Eager as the 2.0 GDI is, there’s only so much Kia’s well calibrated auto can do to scoot along 1580kg. Both springs and dampers have been stiffened, but our Sportage gets an Oz-specific steering tune, front dampers and anti-roll bars. In conjunction with a bunch of NVH improvements, it endows the Sportage with a solid driving feel. 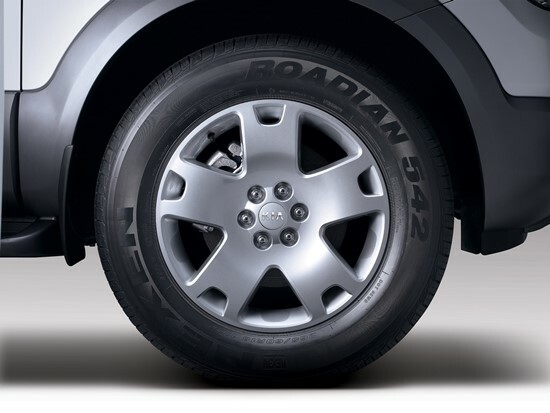 Steering is accurate and evenly weighted, handling is well-balanced, and road noise is fairly unobtrusive, though the ride on Platinum’s 235/55R18s is pretty firm, just like its platform sister, Hyundai’s newly returned ix35. Who would’ve thought that a Sportage could actually be an entertaining drive? Missing out on the ix35’s gutsier 2.4 GDI petrol is probably the greatest tragedy, but besides its lack of proper petrol-engine muscle, it’s hard to think of a reason not to pick a Sportage over its ugly older sister. Whether a six speed manual sweetie for $26K or a tougher turbo-diesel range-topper for $41, this updated Sportage finally lives up to its name. For Kia, football fever didn’t end with the 2014 FIFA World Cup in Brazil in July. After supporting this year’s World Cup as an official sponsor, this month Kia turned to Canada to sponsor and support the FIFA U-20 Women’s World Cup with transportation vehicles and various marketing events including the Kia Mascot Friends initiative. Throughout this year’s FIFA U-20 Women’s World Cup, Kia is providing 70 vehicles to help transport all officials and teams across Canada. Before and during the games, Kia also held several events to help get fans engaged and excited for the U-20 Women’s World Cup. As an extension to the Kia Mascot Friends program from this year’s World Cup campaign, we held a similar event in Canada for our Kia fans. 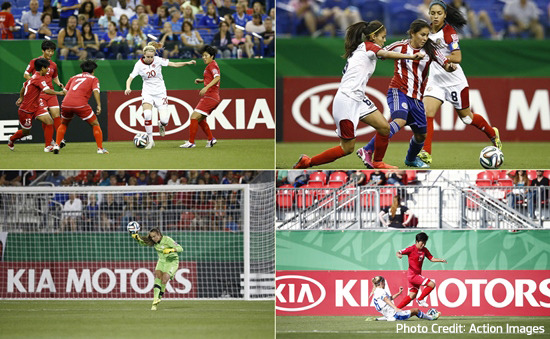 During the FIFA U-20 Women’s World Cup, Kia recognized one young female football player each from the Edmonton, Toronto, Montreal, and Moncton areas, who exemplifies excellent community involvement and spirit. The lucky players had the chance to accompany the official Women’s World Cup mascot—Shuéme—on the field at halftime during the game and host their local teams to watch the match. It looks like Germany is in the finals yet again. Congratulations to the top-placing teams. Be sure to tune in as Nigeria and Germany face-off during the final match on August 24th, after France and Korea DPR play for third place! Kia is proud to sponsor major global sporting events, and we will continue to show our support to encourage the international growth and development of athletics.